Cats are fastidiously tidy creatures who don't require regular bathing because they lick themselves clean — but that's not all they use their tongues for. If you've ever seen your feline friend having a good lick of his food bowl, a plastic bag or even the bathtub, you know cats like to lick a lot of things, some of which are a little strange. We asked our expert Dr. Leslie why cats lick themselves, other cats, humans and some weirder stuff, too. Here are some of the reasons she says kitties love to lick. 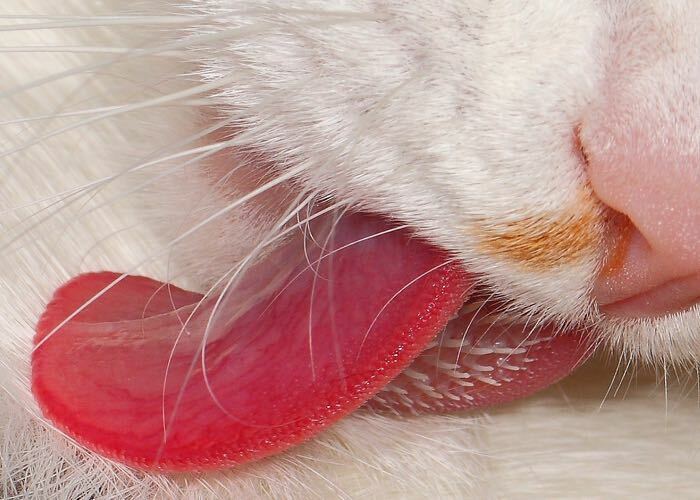 Forget shampoos and showers — cats really only need their tongues to keep clean. A kitty's tongue is covered with hundreds of tiny bristles that point backwards called papillae. According to Dr. Leslie, "this allows the cat tongue to be an effective grooming tool, much like a comb, but a comb with tiny, reverse cups that allow them to also hold liquid, like hundreds of tiny spoons." Talk about multitasking — it's like a loofah and brush in one. Cats don't just lick themselves, they lick other cats as a way to bond. "Rubbing and licking are one way cats demonstrate social bonds with other cats and humans," says Dr. Leslie. This is a behavior that they learn from their mom. Mother cats lick their newborns to show affection and to stimulate their breathing and suckling. If you've noticed your feline friend giving you some licks too, it just means he loves you. "Most studies suggest cats do lick people as a sign of affection and insurance of well-being," says Dr. Leslie. Why use silverware when you have a tongue that works just as well? "The feline tongue has a layer of tiny prickly spoons, so that when a cat licks, it can scrape a surface, collecting material in the tiny spoons," Dr. Leslie says. So when your feline friend is chowing down on his 9Lives® Meaty Paté Poultry Supper Wet Cat Food, those little tongue "spoons" are acting as his feline cutlery. And a cat's tongue is pretty much his only eating utensil. According to Dr. Leslie, "a cat's teeth don't have the rows of molar teeth that omnivores and herbivores have to mash, grind and pre-digest food." Instead, they just use that tongue to scoop up and swallow small pieces of food. Cats lick some really strange stuff, like plastic bags, blankets and even sinks. Dr. Leslie says this could be caused by curiosity. Think of it as your cat using all of his senses — including taste — as a way to check things out. Licking harmless, nonfood items without ingesting them is probably OK, but that natural sense of curiosity can sometimes get Felix into trouble. "While unusual, cats do occasionally taste toxic ointments, gels, foods or residues that can be very harmful. If you notice your cat exhibiting frequent 'tasting,' talk to your veterinarian," Dr. Leslie recommends. According to Dr. Leslie, if your feline friend is licking everything in sight that isn't his dinner, including his own fur, it could be because he's anxious or simply bored. She says a normal kitty will spend about half of the time he's awake grooming himself. If he's doing it more frequently, it could lead to hair loss. "When the licking begins to mow down their fur, it's time to intervene. Excessive licking can be a sign of parasites, neurologic disease, food allergies and endocrine disease, and can lead to skin irritation, infections and even hairballs," she advises. To redirect your feline friend's attention onto something other than licking at himself or other objects excessively, Dr. Leslie recommends engaging your kitty in a game giving her some kitty greens or a comfy windowsill with a view to help enrich her environment and discourage inappropriate licking. While bitter sprays help temporarily, they don't address the underlying cause of the behavior. Instead, Dr. Leslie recommends working with your veterinarian or veterinary behaviorist to help tackle this problem if it continues. Want to keep your feline friend happily licking his food bowl and fur normally (instead of your grocery bags and shower curtains)? Make his home fun! Check out these tips from The Noseprint® on turning your home into a cat paradise and filling it with great cat toys. Photo Credit 1: "Playtime is over” by Paddy and Dushi via Flickr. License info. Photo Credit 2: "natural hair brush for natural fur" by Alexander via Flickr. License info.